Finger pinch, callouses and blisters can all be avoided with the use of a good archery glove. Unless of course you’ve been shooting with your fingers for years, have excellent technique, and you’ve developed a nice thick skin…. For the rest of us normal humans who shoot traditional, recurve and longbows there’s the glove or the tab. Tabs and gloves aren't only for protection though. The right material on the fingers can provide for a far smoother surface for the bowstring to slip off. Your fingers are coarse and designed to grip things, a tab or a glove can help your achieve a smoother release. Some people swear by the tab, others by the glove. It really depends on what you learned with, what you’re used to and what you’re doing. We’re going to focus on gloves. 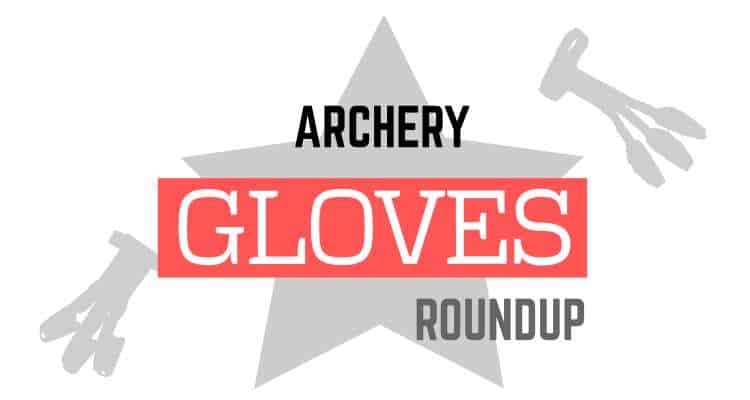 Let’s take a look at what makes a good archery glove and what differentiates it from a tab. ​The normal style of archery gloves looks just like a glove. Take your usual run of the mill glove and remove the thumb and little finger from it, hey presto, you have an archery glove. This type of glove is designed to only cover the 3 fingers with which you pull the bowstring. They normally have reinforced fingertips for heavy weight bows and the opposite for lighter weight bows. The thumb and little finger are left out in the elements so that you can feel with them as they may be acting as part of your anchor. ​Traditional styles of archery glove expose even more of the hand to the elements. They are usually just 3 finger tip covers with 3 strands of material attaching them to a wrist strap. This is the minimum amount of material you need to securely cover the fingers whilst keeping the rest of the hand exposed. Whilst, no they aren't usually completely seamless, a good glove will have no seams on the sides or front of the finger. This means there won't be any material between your fingers to pinch​ when you apply weight to the string. ​Leather is strong and offers good protection from heavyweight bows. However leather doesn't breathe like modern materials. Leather can also crease and wear. The top flight professionals tend to use tabs and gloves made from cordovan leather. That's one of the most expensive leathers in the world. Cordovan is slick and stiff, but expensive. At the opposite end of the spectrum are gloves made from suede, canvas or nylon. These allow you to feel the bowstring through the glove and offer better breathability but less in the way of protection. Before you get any glove, check the sizing. Some are one site fits all. For others the manufacturers will usually offer some sort of sizing chart. You will usually need to know the distance from the tip of your middle finger to your wrist. Also the diameter of your fingertips for some ​better fitted gloves. ​I've already mentioned that some people prefer the tab. If you don't know what a tab is, it's just a piece of material (usually leather) that is positioned between the fingers and the bowstring. Over and above personal shooting preference, here's a few reasons why you might prefer one over the other. When all is said and done, both gloves and tabs for the regular archer are inexpensive pieces of kit. Unless you're buying cordovan leather​ you can easily buy and try both until you find your preference. Damascus Gear supply the armed forces and law enforcement with premium quality hand gear and have been doing this since 1955. Their leather shooting glove has fast become a firm favorite. The leather is soft and supple, so it won't offer protection from heavyweight bows. Anything under about 50 lbs and you'll be fine. A velcro strap secures this on your wrist and the fingertips are reinforced with an extra layer of leather to help with protection. That layer however does still allow for a good feel of the string. Don't be fooled by the name. The backing of this traditional style shooting glove from Neet is suede but the finger tips are smooth leather. This fastens to your wrist with a velcro strap and between the wrist strap and the finger material is elasticated. This means that even though you need to get the correct size the wrist strap and elastic will help to pull down and fit the tips snug to your fingers. Neet produce a wide range of archery gloves and protective gear so you're shopping with a well established brand. They also have a full size chart that includes hand length (from tip of middle finger to wrist) and finger diameter measurements for their gloves. You can find it here. Pellor make a lot of outdoor gear. This traditional style archery glove is one of the most durable leather gloves we've listed. The leather will take a little wearing in and time to soften and mold to your fingers but the result will be worthwhile. You may even want to condition or soak it to speed up the process. This is a nice looking traditional glove that fastens to the wrist with a buckle instead of velcro. The benefits of this style are always that you can feel more with your hands. Those finger tips can be removed whilst it is still attached to your wrist also, allowing you to fully use your hands. This glove only comes in a single size 7.5" or 19 cm from fingertip to wrist but it has an adjustable height of wrist strap with 4 settings so you can adjust it to fit. A cow leather 3 finger glove designed to offer a good level of sensitivity and feel for the bow string. This has a cow leather backing, velcro wrist strap and reinforced fingertips. As always with shooting gloves you need to make sure you get the correct size. If a glove isn't your thing, you might like to try a tab. A tab is a much cheaper alternative which can sometimes offer even more protection. A good alternative to both the tab and the glove is the finger saver. For kids or beginners shooting relatively low draw weight bows and are prone to losing things, this may just be what you need. You'll need to be able to string your bow to fit these. Your bow string threads through them and they simply rest on it and you pull the finger savers rather than the bowstring. You can get finger savers in a variety of funky colors to. If you need to be fast on the draw when hunting and you're looking for something that's always just there that you can't ever lose. Maybe you find a glove or a tab difficult to use. These might be the thing for you.